Several hundred students of Armenia’s state universities and institutes have declared an open-ended boycott of classes as an act of protest against what they say was fraud in the February 18 presidential. The students on strike are those who have given their votes and their support to official runner up of the presidential election Raffi Hovannisian. The opposition candidate has been holding massive actions of protest since February 19, claiming that he is the actual winner. Students demand to “annul the election results and hold new elections”. (Meanwhile, the Central Election Commission today approved the final results of the elections giving victory to incumbent President Serzh Sargsyan). 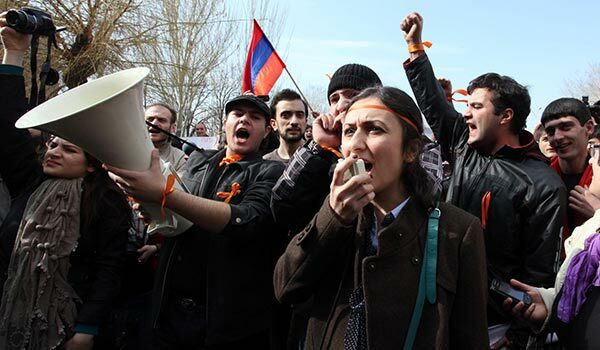 Chanting “Boycott to classes”, “We are the masters of our country”, “Free, independent student” and with posters “You are taking the dead to vote, to do what?”, students rallied for 20 minutes in front of the Yerevan State University; some delivered speeches. “We all know very well who has won in these elections. The factual truth is that the people have won in this race. I urge all of you to stand by our people; I’m calling upon you to join us,” Tigran Ghazaryan, student at Yerevan State University of Economics, said over a loudspeaker. The stairway in front of the central building at Yerevan State University (YSU) had several staff members of the university administration watching the protest, as well as a great number of police officers in the crowd, among and around the students. “Either return to your offices and fulfill your duties, or – and of course this option is more preferable – join our event,” said Daniel Ionnisyan representing the youth wing of Heritage party under Hovannisian’s leadership. He stressed that they are not holding a demonstration, but simply making an appeal to boycott the classes; and that’s up to each student to decide. While the university management complained to the police that the protest held in front of YSU interfered with classes, the boycotting students pointed out that they had chosen to hold the event during a break in classes so as to not interfere. Gevorg Melkonyan, heading the Young University Students’ Union and assistant to the YSU rector, criticized the students for their actions. Earlier criticism was expressed also by the education and science ministry, stating that “the Constitution of Armenia forbids political activities and advocacy at educational institutions”. The YSU professor said they are against “the university being involved in political processes”, at the same time ruled out any pressure upon the students on strike by the university management. It is noteworthy that officially reelected president Serzh Sargsyan is the chairman of the YSU board. Meanwhile, Hovannisian has long been urging Sargsyan to not involve institutes of higher education in political parties – or rather one party, since heads of student councils in Armenia are mostly members of the ruling Republican party, who are mocked by the opposition as “neo-republicans”. Melkonyan made an appeal to the students to express political positions at “the respective places” and “refrain from politicizing higher educational institutions”. He says the Republicans “don’t allow political processes” at universities. “I am the president of the Young University Students’ Union, I have more than 1,200 members, but we do not let any political process enter the higher educational institutions; although, frankly speaking, to say that it is completely ruled out would be demagogy. It is impossible to absolutely exclude such possibilities, but at least to a greater degree we have to stay out of political processes,” he says. After the protest the students marched from YSU to other universities, urging other students to join them. The gates of Yerevan State Economics University (YSUE) and Yerevan State Medical universities had been shut down to not let them in. Despite that, a group of male students at YSUE jumped out of the ground-floor auditorium window to join the strike. They marched to their final destination - the Central Election Commission, where the second count of ballots was being summed up at that moment.